I have to admit that when I first saw these Bora Bora bars in the store, I laughed at the whole motif that they were trying to convey with the clear packaging and the island, fruit and nut themes. But, as I've come to find out in my numerous reviews, they really aren't a joke at all and I actually like them. 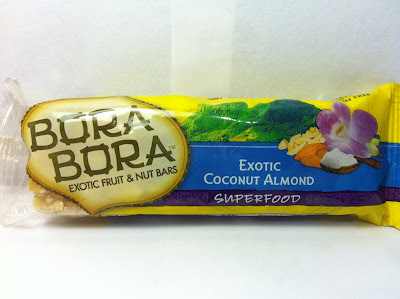 So, that leads me to the last of the group of bars that I picked up at Meijer for $0.75 with this Bora Bora Exotic Coconut Almond Bar. It's a magical and exotic superfood and it clocks in at 1.4 ounces with 210 calories and four grams of protein. As you can see in the picture above, Bora Bora is certainly not shy with the amount and size of the almonds that they put in there. They were present in both chunks and in shavings as well. There's also a fair amount of coconut shivers scattered throughout the bar as well, although not nearly in the quantity of the almonds, of course. The bar is then bound together, along with typical rice crisps, with honey and the various syrups (brown, etc.) that you tend to find in these bars. Biting into this bar was a bit of a chore, but not in a bad way. What I mean by using the word chore is to express how incredibly crunchy this bar was and that was of course provided by the vast multitude of large and small almonds that were spread throughout the bar. Along with this crunch was a strong almond taste, which is somewhat rare since almonds are often a mild tasting nut. I enjoyed that taste, but as I was chewing my way through I was wondering what happened to the coconut until the very end of each chew when the coconut hit. It's flavor was not strong, but it's presence was definitely felt and added a semi-sweet back end to each taste, along with the honey that was present in the mix. The back end continued as well because the coconut taste continued to reside in my mouth even after after I was finished with the bar and while not strong, it was mild enough to be pleasurable. Funny thing is, even with the coconut flavor, the taste of this one reminded me of a breakfast cereal as I was chewing through. Strange, but oddly enjoyable. Buy It or Fly By It? 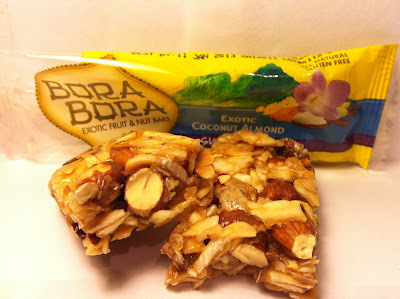 Once again, I've got to give one of these Bora Bora bars a BUY IT rating because I thoroughly enjoyed this bar. While the coconut taste was not strong, it was present enough to let you know you were eating a coconut flavored product. In fact, the flavor was weak enough that even a non-coconut liking person may find this bar enjoyable because it really wasn't the kind of thing that is going to smack you in the face while eating and I know a lot of people out there would appreciate that.